Perfect Audience is a retargeting platform used by many of our clients, and we have its native integration so that you can create dashboard reports using your Perfect Audience data. Connecting Perfect Audience to DashThis requires two easy steps! 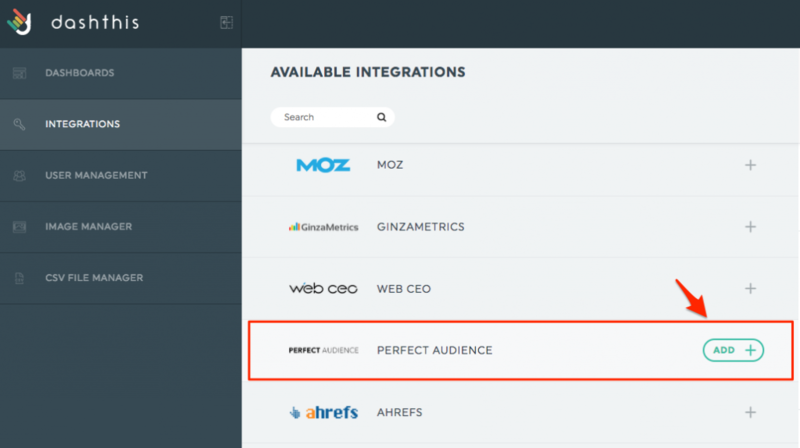 1- In the Integration Manager, choose Perfect Audience and click on Add. 2- Enter the pieces of information of your Perfect Audience account and click on Add. This entry was posted in Integrations and tagged Managing Integration, Perfect Audience.